On my recent trip through the Okanagan, I stopped at 3 wineries. The first one which I wrote about earlier was C.C. Jentsch Cellars. 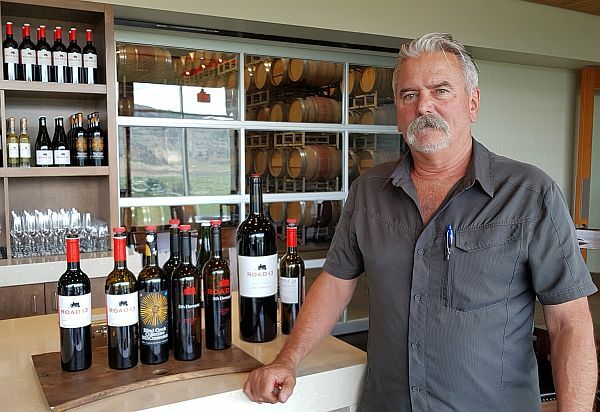 The next day I stopped by a winery that is near to them, Road 13 Vineyards, located on Road 13 just south of Oliver, BC, where I met Mick Luckhurst who with his wife purchased the vineyard in 2003. During Vancouver events, I meet with Joe Luckhurst, who is Mick’s son, but as Joe was on a business trip, I had a chance to meet with Mick and find out background information on the valley, their vineyards, and the amount of work there is needed to keep a winery running. Mick reiterated what I have heard from other winery owners about how much hard work there is to do in the vineyard, the costs of replanting vines, purchasing tanks, etc. It may look glamorous from our side as a consumer, but there is a lot of work you don’t know about. I tip my hat to Mick and all the other winery owners in BC and around the world. Mick generously poured me their flight of wines to taste. Below are the tasting notes of a few of my favourite wines. Road 13 Sparkling Chenin Blanc 2014 – Their sparkling wine is made in the traditional method, with the wine spending 2.5 years on its lees. It is very aromatic showing citrus and lime skin, along with a hint of stone fruit. It is off-dry, medium bodied with a creamy texture. Citrus flavour and tiny bubble. Some minerality on the finish. 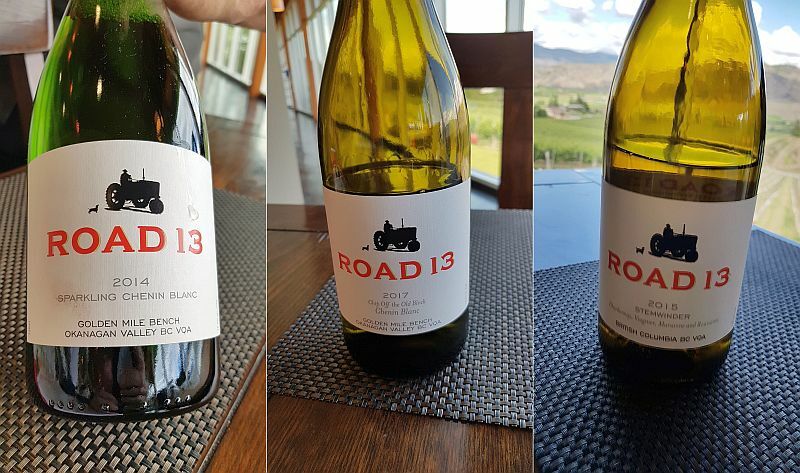 Road 13 Chip Off the Old Block Chenin Blanc 2017 – If you are a Chenin Blanc lover like me, you may want to buy a few of these bottles as Road 13 is no longer producing Chenin Blanc as a still table wine. Their Chenin Blanc grapes going forward will be made into sparkling wine. Chenin can age a long time and is very food friendly, so buy a bunch of these bottles before they are gone. I see on their website that this wine is only available to Club members so you may want to join the Club. This wine has a nice sweet ripe stone fruit nose along with a hint of honey and citrus rind. The wine is off-dry but has higher acidity to balance it. Lighter round, mouthfeel. Citrus and stone fruit flavours. This wine has a nice texture to it. Tart citrus finish. Road 13 Stemwinder 2015 – This is a white blend made of Chardonnay, Viognier, Marsanne, and Roussanne grapes. It has stone fruit, lychee, honey and orange aromas. It is slightly off-dry, with a very thick, smooth mouthfeel. Perfume, citrus rind, and stone fruit flavours, with honey and some pepperiness on the finish. Road 13 VRM 2016 – This white wine is made with Viognier, Roussanne and Marsanne grapes, but the grapes come from their Blind Creek Vineyard located in the Similkameen. A cooler climate area compared to the south Okanagan. It has a light toast, honey and stonefruit nose. Medium bodied, dry, soft and round, with a thicker mouthfeel. It is flowery, has a light stonefruit flavour, along with sweet spices, and vanilla and butterscotch in the background. Elegant. Road 13 Roussanne 2015 – Smoky, ripe citrus and pineapple on the nose. Medium plus body, round with a thick mouthfeel. Slightly off-dry. Flavours of roasted apples, ripe tropical fruit, in particular, pineapple, along with honey and some spice. Medium acidity keeps this wine from being flabby. The wine also has a smoky or flinty component to it. Road 13 Honest John’s Rosé 2017 – A blend of 70.5% Merlot, 19% Gamay Noir, 4.9% Viognier, 4.1% Syrah, 1% Pinot Noir, and 0.5% Cabernet Franc. Light translucent garnet in colour. Aromas of fresh strawberries, red cherries, rose petals, and a hint of acetone. Semi-sweet, round, medium bodied, and medium plus acidity. Flavours of red cherries and light rhubarb. Another wine that has a nice texture to it. Tart red fruit finish. A fun, easy sipper. 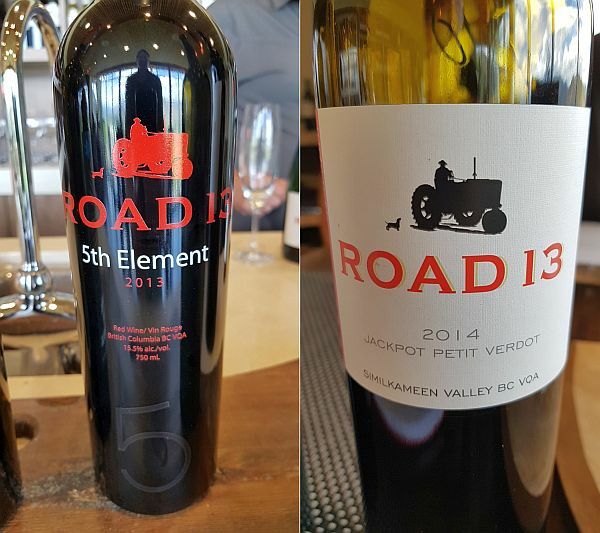 Road 13 Jackpot Petit Verdot 2014 – The name Jackpot comes from the name of a gold mine in the area, when there was a mini gold rush in the south Okanagan. This wine has a medium intensity nose showing sweet spices, ripe black fruit, black currants, floral and Christmas pudding aromas. It is fuller bodied, mineral, round with firmer tannins. Black fruit flavours with pepperiness showing up mid-palate and a floral undercurrent. An intense wine. You can purchase their wines through the Road 13 website. There are also many restaurants and retail wine shops in BC and Alberta. The full list of retailers is at this link.